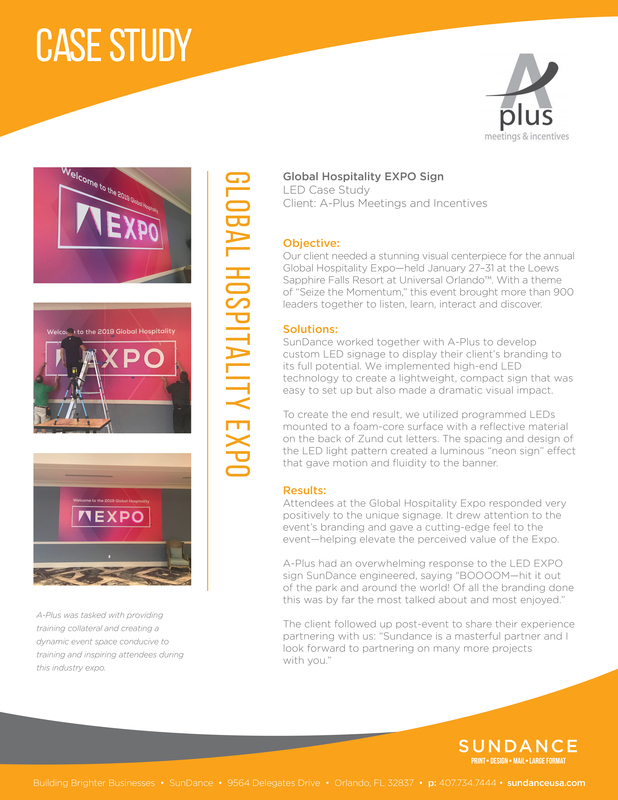 Our client is an award winning meeting and event service provider that assists corporate clients needing anything from assistance to full service aid in corporate trade shows and events. They travel all over the country setting up, coordinating and managing their client meeting and events. Employee “Welcome Aboard” Kit Takes Flight! Creating a personalized and targeted onboarding process helps employees feel welcomed and valued by their new employer. 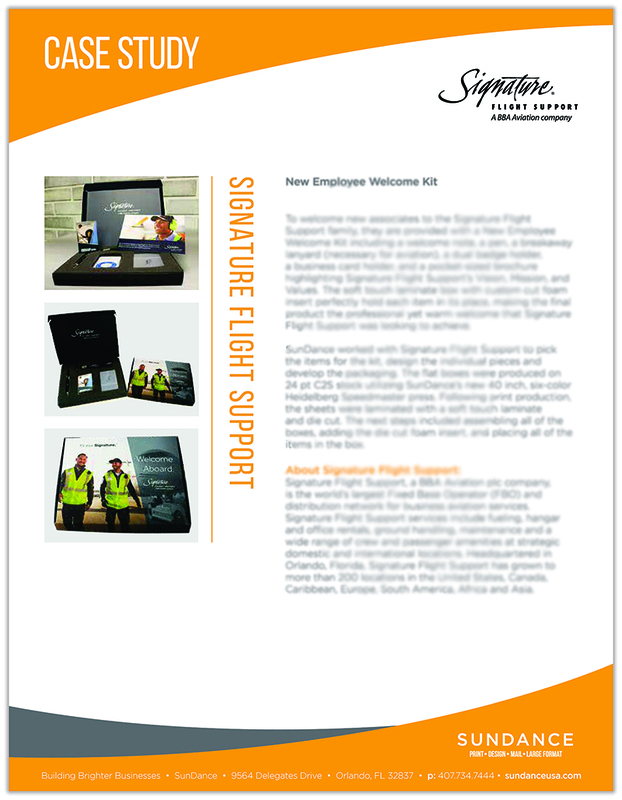 Signature Flight Support wanted to produce a piece that would enhance this experience for all new team members. They turned to SunDance to create a complete New Employee Welcome Kit with this goal in mind. 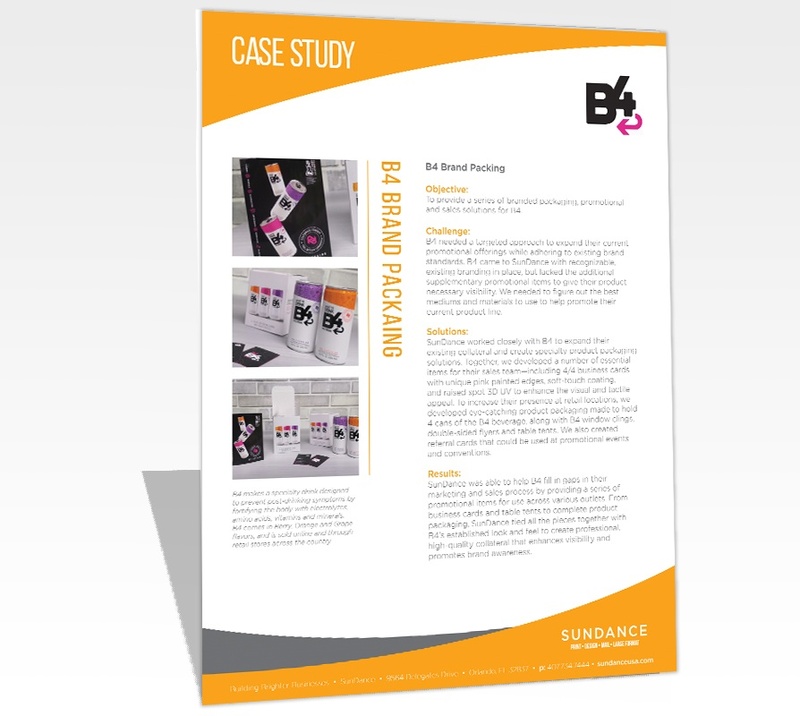 B4 partnered with SunDance to manage the expansion of their multi-channel promotional campaign for B4's brand of specialty vitamin-infused beverages. Our range of in-house services and industry expertise allowed us to guide them through the process of creating complementary branded materials, collateral, and promotional items to promote their unique beverage line. Find out more and see the campaign results for yourself in our latest case study. Hard Rock International tasked SunDance with creating and engineering a multi-tier brand package including over 20 individual items for their Annual Conference. 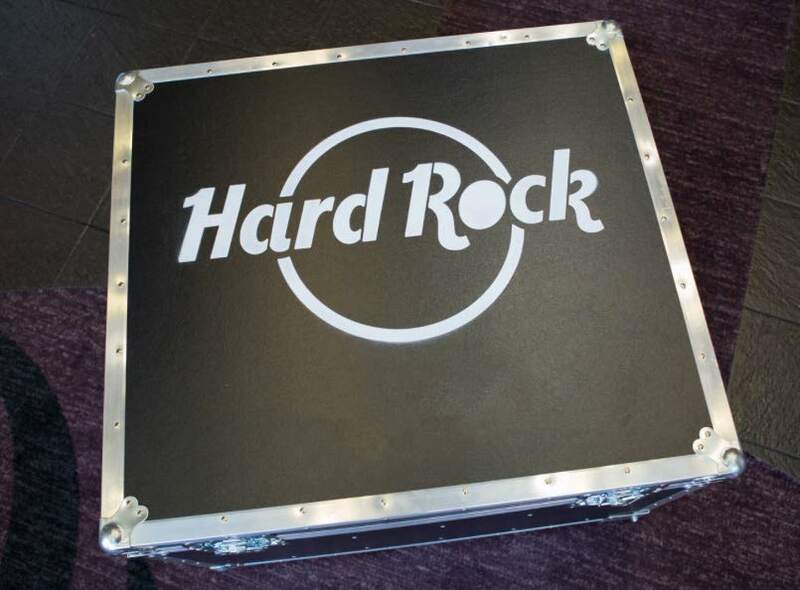 Featuring luxury papers and specialty finishing techniques, this project highlighted the best of Hard Rock’s distinctive branding. See how the package came together and propelled the SunDance and Hard Rock partnership. SunDance embarked on re-branding through new collateral and educational events for partners and clients. The campaign covered multiple mediums and became the springboard for future successful branding avenues. 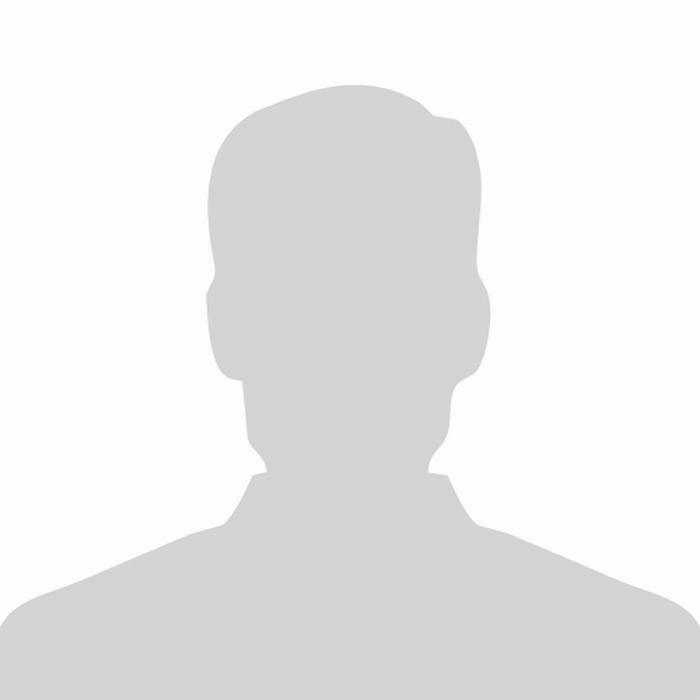 See how we achieved over a 10% response rate and 53% conversion rate! 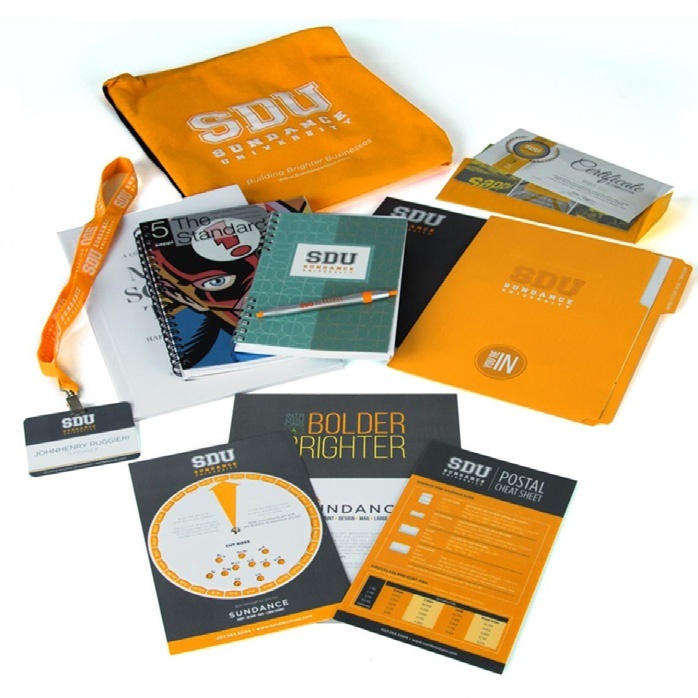 SunDance was tasked with developing a set of high-quality, adjustable binders, along with a presentation box for high-level brand presentations across the world. 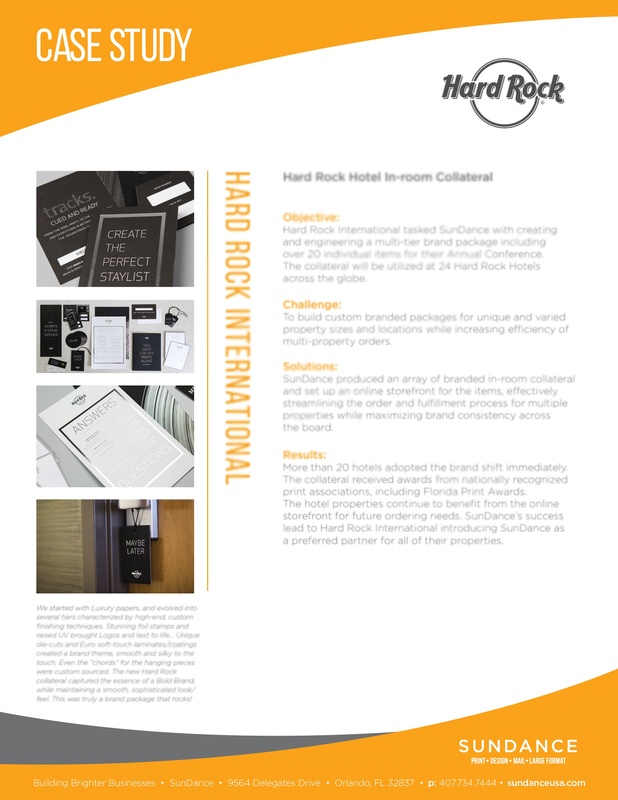 Hard Rock International needed a unique, first-rate print package that was attractive and study while following a strict set of brand standards. Find out how SunDance completed the project and made a lasting impression.